Staying in Arrecife 23 is a gorgeous way to enjoy Punta Cana Resort. It has wrought iron and travertine accents, high ceilings, and spacious bedrooms that provide an oasis for every guest. I love how everything you could want to visit on the island is less than ten minutes from the Resort, and there’s plenty of space for you and your guests to hang out together or retreat to your own suites. 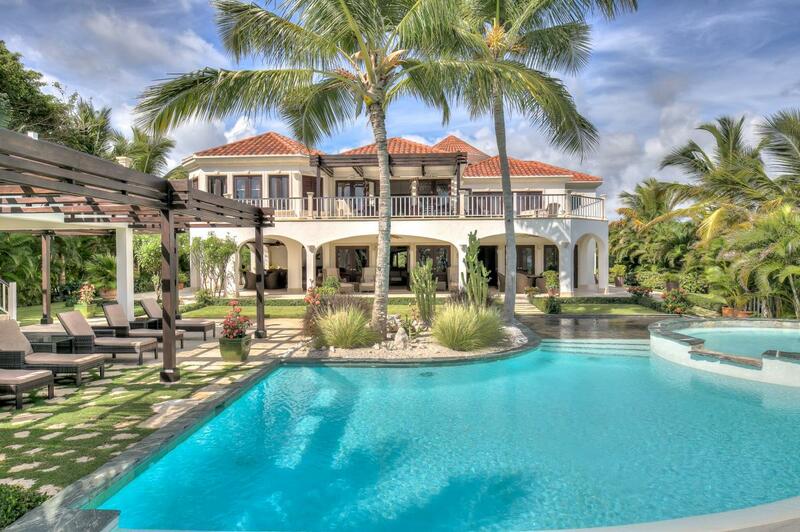 Arrecife 23 is a four-bedroom villa in Punta Cana Resort. Situated on the golf course with ocean views on the horizon, guests have colorful coral reefs, calm waters, and a surplus of activities at their fingertips. The curved pool sits below the Jacuzzi surrounded by palm trees and shrubs. A lounging veranda runs along one side, and there’s a large wading area for children. By the grilling area, there’s a wraparound bar with seating and a glass-topped dining table. The arched gallery opens to the breeze, but is shaded and cooled with a ceiling fan. For an additional cost, guests can enjoy Punta Cana’s golf, tennis, sailing, water sports, snorkeling, SCUBA, and horseback riding. There’s also an on-site fitness center and spa. The exquisitely decorated foyer leads guests into a large living room and a fully equipped kitchen with an island in the middle. The living room opens to the veranda through a wall of French doors, and a flatscreen TV provides entertainment. The kitchen is fully equipped with stainless steel appliances, expansive countertops, a coffeemaker, and a blender. The formal dining room has seating for 12 and opens to the veranda. Just off the entrance, there’s a master suite with a king bed, a twin daybed, a crib, a lounge, and a flatscreen TV. It’s walk-in closet is in a hallway that leads to the ensuite bathroom, which has a rain-head shower and dual vanity. Upstairs, the three bedrooms wrap around the gallery. The upper master suite is closest to the stairs and has a king bed, two lounges, an office, a soaking tub, a flatscreen TV, and access to the balcony. In the ensuite bathroom, there’s a rain head shower, dual vanity, and exterior access. Opposite the master suite, there’s a guest suite with two queen beds, a twin bed, a flatscreen TV, a walk-in closet, and an ensuite bathroom with a rain-head shower and dual vanity. Near the upper living space, there’s a king suite with a flatscreen TV, a walk-in closet, and an ensuite bathroom with a rain head shower and dual vanity. Arrecife 23 is located in a 26-square mile paradise that’s a short drive from the beach, airport, supermarket, and Ojos Indigenas. The Resort provides an excellent experience for families, friends, and couples.